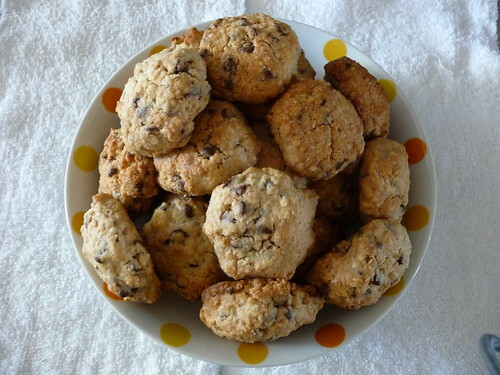 Posted by misscraftyfingers in Baking, Blog, Recipe. 1. Pre heat your oven at 175 degree Celsius. 2. With an electric mixer, mix the softened butter with sugar until well blended. 3. Add vanilla essence and egg to the mix and mix till light and fluffy. 4. Add in oats, flour, baking soda and salt. (sift in the flour together with baking soda and salt) and mix with a wooden spoon or spatula. 5. Add chocolate chips and mix till even. 6. Make a ball of cookie dough (about a spoonful). Place the ball of cookie dough onto a cookie sheet. Pat it down to smooth it. 7. Bake cookies at 175 degrees Celsius for about 10 minutes or until golden brown. 8. Let cookies cool on rack before storing away. I can bake up to 12 cookies at one go as these cookies do not spread out when baked. If you like chewier and sweeter, I guess you can add more sugar but I wouldn’t recommend it. The original recipe used 1 1/2 cups of sugar! I only used 1/2. 😀 If you like more butter taste, you can add up to 1 cup of butter. Now I shall go eat my cookies. ONOMNOMNOMNOMNOMNOM!